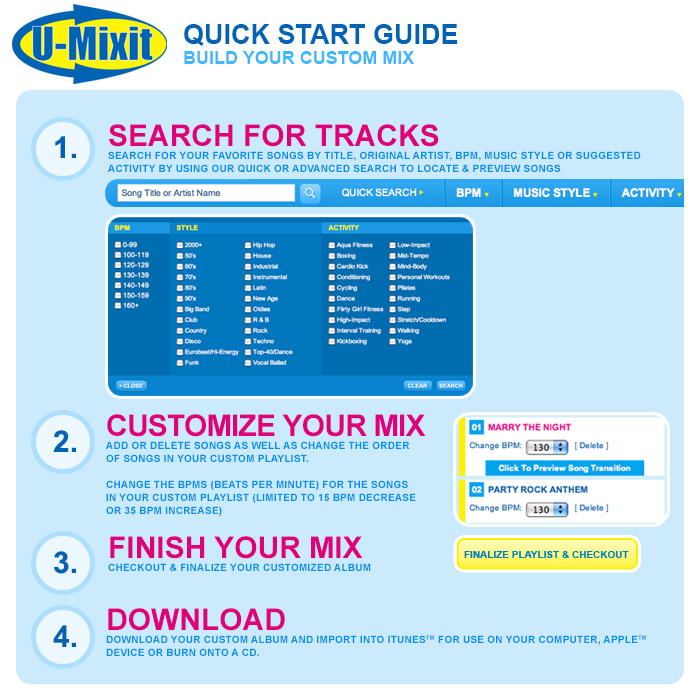 In order to download a customized U-Mixit music album, you will need to complete your purchase first. Simply add songs to your playlist, set your desired BPM for each song, preview the song transitions and then finalize your playlist to proceed though the checkout process. When you are completing your order on our website, we will obtain a credit card approval at the time you click on "submit order" during final checkout. Assuming your credit card is approved, your computer will display a confirmation page instantly which will include the link(s) for your album download(s). If you would like to download your music file(s) at that time, simply click on the link(s). Please remember we will be compiling your custom playlist so there is a wait time while that process is completed before you can retrieve your album. If you would like to wait until a later time, you will also receive an email order confirmation which will include a link for your download file(s). You will have 7 days from the time you complete your order to download your music. Anytime during the 7 days you will just need to click on the link and then follow the prompts to log in to your account on our website and download the file(s) to your computer. If you need further help or your download is unsuccessful, please call our support team at 1-800-843-6499. Technical Support is available from 9AM – 5PM Eastern Time Monday through Friday. Dynamix 1-Click Downloader completes the download process for you! Introducing the all new Dynamix 1-Click Downloader for desktop ... the easiest music download automation tool you'll ever use! If you have not installed this tool before, follow these instructions and enjoy the trouble-free simple experience of downloading music from Dynamix & U-Mixit. Please Note: You will be downloading a desktop application to your computer. Once you download the Dynamix 1-Click Downloader, you will need to locate the file, double click it to begin installation and follow the instructions to complete the process and then launch the application from your desktop. FREE Dynamix 1-Click Downloader Security Questions? 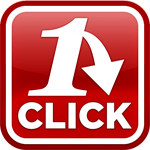 Returning Users: Run the 1-Click Downloader from your Desktop, Programs (PC) or Applications (MAC) Folder, login and download your music with 1 simple click. If you have difficulty or for some other reason cannot install the Dynamix 1-Click Downloader, you can click on the “Manual” link below to download your music. Please Note, if you choose to download your music manually, the file(s) you will download will be in a ZIP format which will need to be opened on your computer once the download completes. The ZIP file will include a file folder for each album you purchased. Inside the file folder will be each individual track associated with the album(s) you have purchased. The tracks will be in sequential order and will play continuously one after the other. The music files you download from our site will all be MP3 files. When you are ready to download the file from our website, you will click on the manual download link from your list of active downloads within your account. When you click on the link, a window will appear asking you if you want to run or save the file. Please choose "save". Once you choose "save", a window will appear showing various locations on your personal computer. You should select a destination that you can locate easily (examples are "desktop", "temp", "C-Drive" etc.). When the download is complete you will then be able to locate the file in the destination you specified. To open the downloaded ZIP file, double click on the file and it will open another window. You should click one time on the file folder in this new window with your mouse and while holding down the the left button of your mouse, drag the folder to a location on your computer that is easy for you to locate (desktop is a common choice). This will create a folder on your computer that you can now use. If you like you can delete the ZIP file that you downloaded as it is no longer required. At this time, to ensure our albums play without any gaps between the songs, you will need to add the songs to I-Tunes. You can then put the album(s) onto your IPOD or create a CD from I-Tunes. The easiest way to add our album downloads to I-Tunes is to add the folder of the album you downloaded to I-Tunes by choosing "Add Folder To Library" from the File Menu in I-Tunes and then highlighting the folder you want to add. Then you will need to create a playlist and then choose "burn playlist" to create your CD. This will ensure that the songs stay together, in order and play back without interruption. At this time, to ensure our albums play without any gaps between the songs, you will need to add the songs to ITunes. You can then put the album(s) onto your IPOD or create a CD from an iTunes playlist. IMPORTANT REQUIREMENT FOR CD BURNING: If you will be burning an audio CD of your downloaded U-Mixit album, you will need to adjust two (2) settings that appear at the time you place a blank CD into your computer. In order to ensure that the CD plays back continuously and without gaps, you will need to set your "PREFERRED SPEED" to: 2X. This is the burning speed for creating the CD, not the tempo of your music. The 2nd setting is to select "AUDIO CD" with the "Gap Between Songs" = NONE. Gap between songs on burned CD: It is possible you are using an older version of iTunes. You may need to adjust your preferences for CD burning in iTunes by choosing the "Edit Tab" and then "Preferences". Then in preferences, click on "Advanced" and then the tab called "Burning", under audio disc format, change the "PREFERRED SPEED" to: 2X and the "Gap Between Songs" to "None". Breaks between songs playing in ITunes: In ITunes, Choose the "Edit Tab" and then "Preferences". Then in preferences choose "Playback" and uncheck the box for "Crossfade Playback". 1) How long do I have to download an album after I purchase it? You must download each album within 7 days of purchase. 2) How long does it take to download music? The time of day, number of site visitors, the speed of your computer, the speed of your internet connection and the speed of your internet service provider will all affect the time it takes for you to download your album from our site. Most albums of 10-15 songs will be able take between 10 and 30 minutes to be downloaded from our site. 3) How do I locate the file after I download it to my computer? When you are ready to download the file from our website, you will click on the download link in your account. When you click on the link, a window will appear asking you if you want to run or save the file. We recommend that you choose "save". Once you choose "save", a window will appear showing various locations on your personal computer. You should select a destination that you can locate easily (examples are "My Music", "Desktop", "Temp", "C-Drive" etc.). When the download is complete you will then be able to locate the file in the destination you specified. The ZIP file will use your order number as the file name and inside will be each individual track associated with the album you have purchased. The file(s) you download will be in a ZIP format which will need to be opened/uncompressed on your computer once the download completes. 4) What do I need to burn songs I download onto a CD? You need an internal or external CD-RW drive and blank CD-R disc(s) that are compatible with the write speed of your CD-RW drive. IMPORTANT REQUIREMENT FOR CD BURNING: If you will be burning an audio CD of your downloaded U-Mixit album, you will need to adjust two (2) settings that appear at the time you place a blank CD into your computer. In order to ensure that the CD plays back continuously and without gaps, you will need to set your "PREFERRED SPEED" to: 2X. This is the burning speed for creating the CD, not the tempo of your music. The 2nd setting is to select "AUDIO CD" with the "Gap Between Songs" = NONE. 5) I have paid for music that I have not been able to download, what can I do? Please contact the Dynamix Music customer service department within 7 days of submitting your order on our website. Our customer service department can be reached by telephone at either 1-800-843-6499 or 443-378-5113 Monday-Friday between 9AM and 5PM ET or by email at: dynamix@dynamixmusic.com. 6) I see an error message when I try to download a purchase, what do I do? Please contact the U-Mixit customer service department within 7 days of submitting your order on our website. Our customer service department can be reached by telephone at either 1-800-843-6499 or 443-378-5113 Monday-Friday between 9AM and 5PM ET or by email at: problemresolution@u-mixit.com. 7) What do I do if I don’t like the music I downloaded, Can I return it? Unfortunately, album downloads from our website are not returnable. We do offer the ability to preview a sample of each song and every transition on your customized playlist. We encourage you to take advantage of this service prior to making your purchases. 8) My download speed is slow, how can I speed it up? Downloading speed can be affected by the time of day as well as the amount of traffic on our website. You may try downloading your album at another time of day that might be less busy. Typically later in the evening or early in the morning may improve the speed. 9) The song file I downloaded is corrupt, how do I get another? Please contact the U-Mixit customer service department within 7 days of submitting your order on our website. Our customer service department can be reached by telephone at either 1-800-843-6499 or 443-378-5113 Monday-Friday between 9AM and 5PM ET or by email at: problemresolution@u-mixit.com. 10) Is the music file I download compressed in any way? Yes, you are downloading MP3 files which are a compressed format so that the file size is manageable. We do use 320-bit resolution which provides excellent playback quality. 11) I have a firewall, will that stop the download? It is possible that the settings on your computer could affect your ability to successfully complete an album download. To avoid problems with downloading and playback, please make sure you do the following: Use Internet Explorer version 6 or later. Use the latest version of iTunes. Disable pop-up blockers. Verify your firewall settings are configured appropriately. It is possible you may need to temporarily turn off your firewall, however, Dynamix Music is not responsible for any computer issues related to your system software, application software, hardware or configuration settings. 12) If I lose my album file in a hard drive crash, can I download it again at no cost? Unfortunately not. We are unable to offer replacements at no cost. We recommend that you use an appropriate procedure to ensure all of your files are safely backed up.